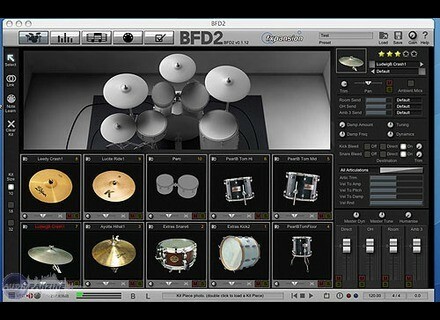 BFD2, Virtual Drum/Percussion from Fxpansion in the BFD series. Product replaced by the Fxpansion BFD 3.
sw80's review"It gives plenty of options all in a user friendly interface"
FXpansion BFD2 Acoustic Drum Module does not use much CPU/RAM or hard disk space. It will work with a Windows system running XP, or Vista. It will also work great on a Mac computer as well if you have 10.4 OSX or higher. My laptop only has 1 GB of Ram and it worked just fine I just had to have a connection to the internet so it can be authorized (you will have to have an internet connection to authorize this product). There are a total of 32 outputs on this Module, that means that I was able to bring in plenty of external effects and plug ins from other sources. All of the sounds are very warm and real, they are all recorded in a professional studio with amazing quality and ambiance. The hi hats sound very good and so do the crashes, they are some of the most real live sounding samples that I have heard this far. The interface is simple to work with because it is designed with the “new” user in mind. Though I have used many other products similar to this one it was still nice to know that they have a watered down interface that is easy to start with a learn from. There are also some very good mixing options to work with like routing, dynamics and EQ. I hae even routed audio from 16 mono outputs to other VST hosts. There are plenty of grooves in this software, I am pretty sure there are over 5 thousand of them and they can be changed to go with whichever style of music that I am working on at the time making this software very versatile for me. There are so many options that you have with this VST, and so many different things that you can do with it. The interface does not seem like it because it is very basic compared to other interfaces. If you take the time to understand everything or refer to the manual you will really understand how to work with this plug in and get the best possible results out of it. tarrtime's review"Most Versatile Drum Software"
BFD2 is a drum-sample playback engine that can be used in stand-alone or as a plug-in in a DAW. 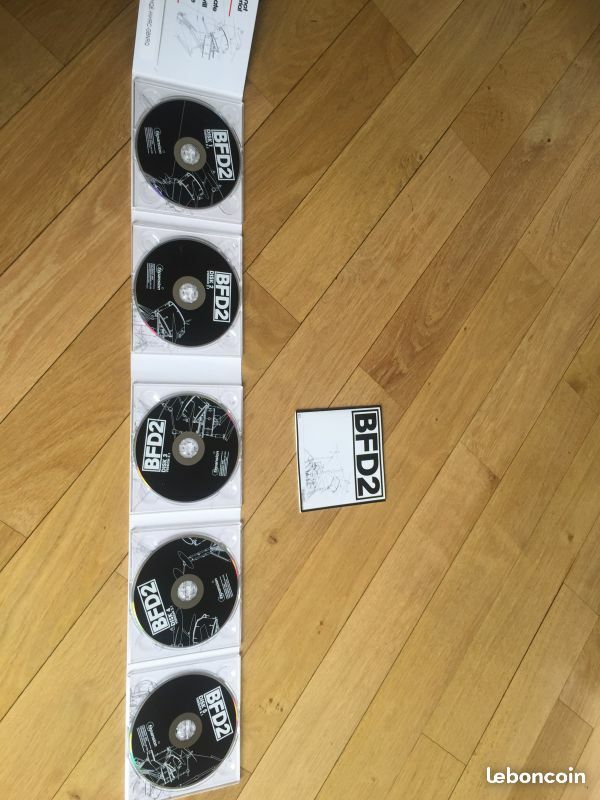 I purchased BFD2 as an upgrade to BFD1. There were some decent drums sounds in BFD1 (vistalite, ayotte), and the interface was simple to understand. 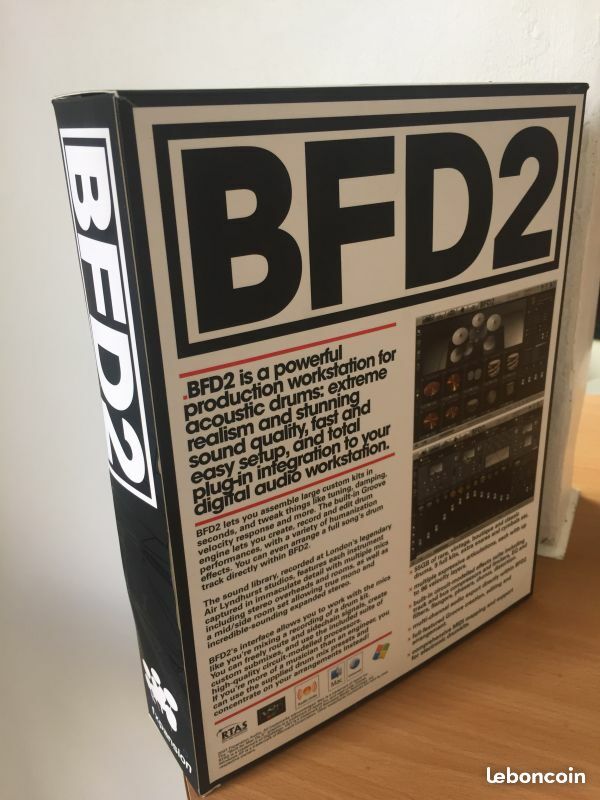 BFD2 was a huge improvement in every aspect of the software. The interface is pretty complicated, but after you play around with it for a couple sessions, you will get the hang of it. Installation takes a while as the package comes on a bunch of DVDs. It is recommended to install the samples on a separate harddrive than the drive you use for tracking in your DAW. This is supposed to improve playback. I didn't follow this recommendation when I first bought the software and installed everything on the internal harddrive of my laptop. It wasn't the best idea, but it worked. Eventually, I got around to storing the samples on an external drive. Big F'ing Drums 2 lives up to its name. The samples can sound massive if you bring up the room mics and add some compression (the library comes with john bonham's drums, what would you expect). But, what I really like about this library compared to other libraries (SSD4, Superior Drum 2, etc.) is the versatility. The massive drum sound can easily be scaled down for a more intimate drum sound, if desired, by picking the right sampled instruments. I can't really say the same is true for SSD4 (to each his own). Fxpansion did a great job of picking different drums that complement each other in the library. I am also convinced that the drummer hit the drums a little bit differently to get different sounds depending on the style of music/playing that would typically be used for each kit piece. It seemed like some snares the drummer really pounded during record, while other snares don't really give me the same impression. This is actually a really good thing - it gives more variety to the stock library. Toontrack SDX's offer this same kind of playing variety, but then you have to make additional purchases to get the same thing as BFD2. I really like the cymbals in particular in BFD2. Even if I am going to use the drums from a different software library (because they fit my song better), I almost always substitute the BFD2 cymbals. I definitely give the stock cymbals a strong recommendation, but the Zildjian Digital Vault cymbals that can be used inside BFD2 are also awesome. BFD2 offers a pretty advanced mixer and internal effects. However, I also recommend with any drum library to utilize the 'multi-out' functionality, and use plug-ins in your DAW to process individual drums. This is probably the most important way to achieve realistic drum performances with sampler software. Never use internal effects! They simply can't compare to the EQs/Compressors from WAVES/UAD/etc. The best part of BFD2 is the fact that the stock libary is awesome. There are 'expansion packs' available, but my opinion is that the stock library is sufficient on its own. Superior Drummer 2 is good, but you really need to buy expansion packs to make it versatile. I also recommend layering BFD2 samples with other drum libraries. There are a lot of drums in BFD2 that have a great sustain/ringing that I don't find in other libraries. I can't wait for BFD3, I hope it is just around the corner. 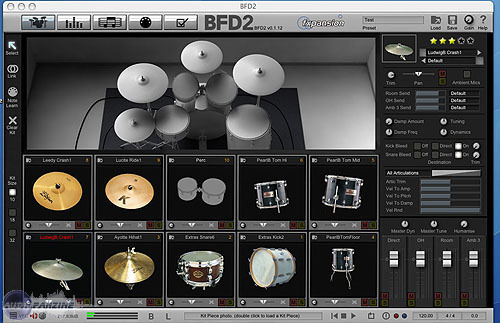 FXpansion BFD 2.0 virtual drum library is one of the biggest, greater and most expensive drum library. FXpansion BFD 2.0 virtual drum library is compatible with Windows xp, Windows 7, Vista, MAC OS X, there wasn't any issues regarding compatibility. The manual is quite clear and sufficient to get a better understanding of the drum sounds and library. The general configuration and setup isn't very simple, and it requires some time because of the size of the library which is around 55 gb. The typical functions are easily accessible and well structured on the chanels. The software work correctly in this configuration. The software and gear is stable. I'm getting good performances regarding drum grooves and velocity changes. I've been using this product for just 2 months now, but I love it. The price is pretty high, this expansion costs around 600$, however getting to know this library, it's pretty damn worthy, you have 55 gb of samples to mess around, you have plenty of features to humanize your groove, you can overlay many and many samples to create something that sounds unique. I can say, if you can afford it, buy it. The precision and quality of the sound is on a high-level, I like especially the snares and kicks, but the toms and hats sound decent also. I"ve tried many and many drum expansions, this is one of the most expensive and one of the best, the only one I could think that is pretty similar regarding quality and features is Addictive Drums. I would buy this product if I'm interested in drums library and I'm searching for something that sounds big and pro. No problems... But installing six DVDs does require some time. It's a pity that you have to decide the configuration in advance (light, medium or full). You have to choose one configuration and you can't change anymore after that. I installed BFD on two powerful computers, a desktop PC (Intel Quad Core @ 3.0 GHz with 4 GB RAM) and a notebook (MacBook Pro 2.5 GHz with 4 GB RAM). Considering the high price of the product, I find this software doesn't work well. On my computers, it's the most instable and inefficient software I own (I mainly use Reason 4.0, Logic Pro and many VST and AU instruments). UPDATE: The stability problems with my MacBook Pro are gone ever since the last update, but I didn't notice any improvement with my PC (BFD2 is not reliable at all under Windows XP, it only works when it wants to). PC reliability is really frustrating. Many bugs that I don't understand, it takes too long to load, noise... It's an expensive product with a complicated configuration and a poor performance. I'm not used to sample players with large sound banks, it's actually the first one I own, and after three months of use I'm quite frustrated and disappointed... It makes me angry and drains my creativity. The troubleshooting at the manufacturer's website is not very useful. UPDATE: Even though everything works better with MacOS now the software still generates very unpleasant digital noise. Stable with MacOS 10.5, unstable with Windows XP for unknown reasons! Main advantage: Amazing sound quality. If you like loud drums in a mix, it's the best tool I've ever tested. The sample bank, the numerous articulations and the endless mixing possibilities are everything you need to create your own distinctive sound for your productions. You'll obviously need some time to master it and get the best out of it but the results will be absolutely professional! Don't record your drummer friends in an average quality studio anymore it's a waste of time and money. Choose BFD2 and you'll get a great drummer recorded in an professional studio for a ridiculous price! (smile). It might sound radical but for me the end does justify the means. And BFD2 gives me better results than a real drummer in an average quality studio. And I save a lot of time! Real drummers will argue that you won't ever get the sensitivity of a good hi-hats or cymbal played by a real drummer and they are probably right, but that won't change my mind as a producer. If you program, edit and balance them correctly BFD2 drum parts sound very professional. The quality of the integrated mixer's effect plug-ins is another advantage (it's a pity that you cannot use them as AU/VST plug-ins! ): they sound really professional! Another important asset is the internal sequencer, it's simply unbeatable! It provides everything you need to produce ultra authentic drums. I also like the groove and velocity humanization factors as well as the swing parameters. With these tools your beats sound incredibly authentic. Your musician friends will start wondering how the hell you could afford a studio session with such a great drummer (LOL)! Cons: you need a lot of time to master this tool and be able to create your own sound. But once you've done that... you'll discover new possibilities! This ultra professional drums workstation is incredibly effective. The biggest turnoff is the high CPU load. Without a state-of-the-art computer, a sound card and a Midi interface you won't be able to exploit its full capability... I have a very powerful PC but it doesn't like this software that much! With my Mac the program works almost perfectly... almost! Did you try any other models before buying it? 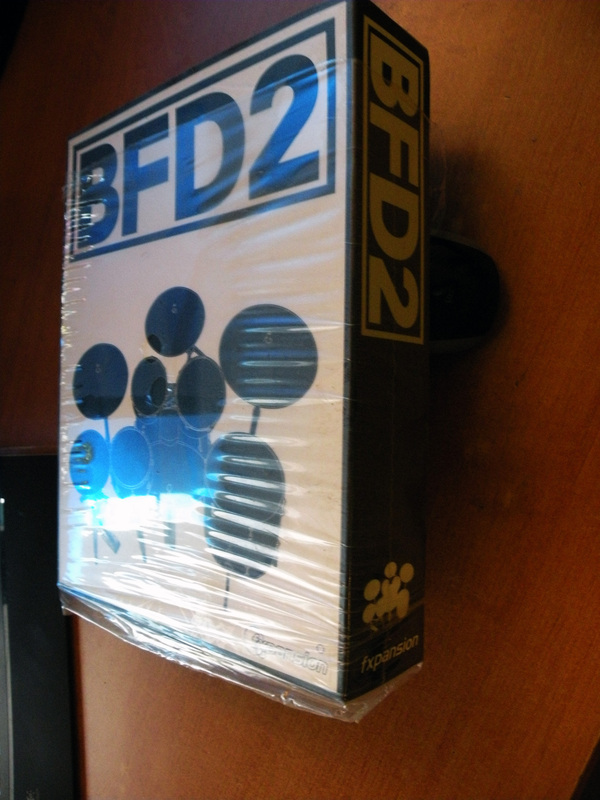 I used drum machines (Roland R-5 and Akai MPC), then Reason and its additional Reason Drumkit pack and now BFD2 and EZdrummer with additional packs. I haven't tried Superior 2 yet. BFD2 is a professional production tool regarding pattern editing (humanize function, swing parameters, multiple articulations, etc.) and sound editing. I also use EZdrummer, which doesn't need as much computer resources and can easily fit in a mix. But BFD2 offers more possibilities and a better sound. I must say that in order to get a good sound out of BFD2 you need to have some experience. Expensive considering the poor performance (I hate the awful digital clicks when pushed to the limits). UPDATE six months later: It works fine on my Mac ever since the last update, so I changed my mind about it and now I believe this software and its huge high-quality sample library are worth its price. I would buy it again with my eyes closed. Drums/bass rhythm parts are are my specialty so I'm thinking about upgrading my EZdrummer to Superior 2. Overall mark after six months: 9/10 because I'm sure it's still possible to conceive a better tool.